Easy A (2010) is the last significant box-office success in the high-school teen movie subgenre and a film that has already been deemed a ‘classic’ by many cultural commentators and popular film critics. By applying interdisciplinary insight to a relatively overlooked movie in academic discussion, Easy A: The End of the High-School Teen Comedy? is the first in-depth volume that places the movie within several key contexts and concepts of intertextuality, gender, genre and adaptation, and social discourse. Through the unpacking of a complex narrative that draws its plot from Nathaniel Hawthorne’s The Scarlet Letter (1850) and shares affinities with John Hughes’ paradigmatic films from the 1980s and key films from the 1990s, this volume presents Easy A as a palimpsest for the millennial generation. 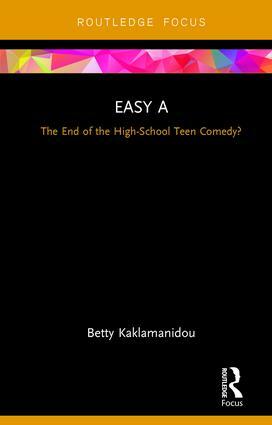 Clear and comprehensive, the book argues that Easy A marks the end of the commercially successful high-school teen comedy and discusses the reasons through a comparative synchronic and semi-diachronic historical comparison of the film with contemporary cinematic texts and those of the 1980s and 1990s. Betty Kaklamanidou is a Fulbright scholar and Assistant Professor in Film and Television History and Theory at Aristotle University, Thessaloniki, Greece. She is the author of The ‘Disguised’ Political Film in Contemporary Hollywood (2016) and Genre, Gender and the Effects of Neoliberalism: The New Millennium Hollywood Rom Com (2013) and co-editor of Politics and Politicians in Contemporary U.S. Television (2016), The Millennials on Film and Television (2014), HBO’s "Girls" (2014) and The 21st Century Superhero (2010). She is currently co-editing a collection on post-2008 European cinema. Betty’s articles have appeared in Television & New Media, Literature/Film Quarterly, Celebrity Studies and The Journal of Popular Romance Studies. Cinema and Youth Cultures engages with well-known youth films from American cinema as well the cinemas of other countries. Using a variety of methodological and critical approaches the series volumes provide informed accounts of how young people have been represented in film, while also exploring the ways in which young people engage with films made for and about them. In doing this, the Cinema and Youth Cultures series contributes to important and long standing debates about youth cultures, how these are mobilized and articulated in influential film texts and the impact that these texts have had on popular culture at large.